The glaze chicken is what we love most...! Therefore we returned and satisfied our cravings here in one of the Korean restaurants located in Makati City. 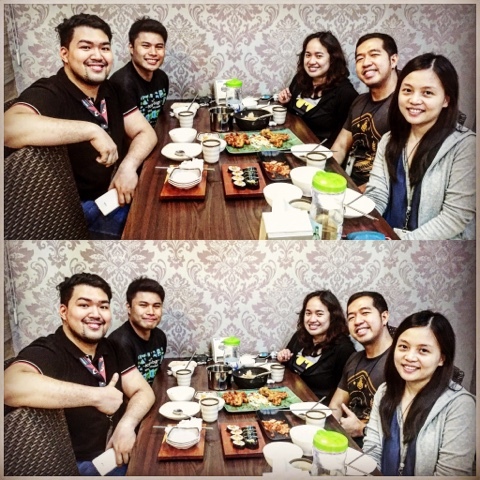 This was our second time around to spend our barkada dinner in Big Mama, a Korean restaurant in our city. Well, as its name suggest, you will truly enjoy its big serving! The chicken will definitely surpass your expectation! Aside from the chicken, what captured our senses were the seafood soup, the kimchi, the veggies, and the shrimp and tuna makis! Well as you can see in our group photos above, happines fulfilled the place - we were all delighted not only with the food served but also with our cool kulitan bonding together!